Home›Blog›How is micro-irrigation of PVC lay flat hose carried out? How is micro-irrigation of PVC lay flat hose carried out? In the process of micro-irrigation, low-pressure agricultural PVC lay flat hose was used to irrigate water into the soil near each plant, which often maintained low water stress to meet the needs of crop growth. So, what advantages does the PVC lay flat hose manufacturer have in utilizing agricultural PVC lay flat hose micro-irrigation? 1. Water saving: Micro-irrigation can timely and properly irrigate crops according to their water requirements, only need to wet the soil near the root, thus significantly reducing irrigation water consumption. 2. Strong adaptability to soil and topography: micro-irrigation PVC lay flat hose manufacturer uses pressure pipes to transport water near each crop root, and can work under any complex topographic conditions. 3. Energy-saving and yield-increasing: The working pressure of micro-irrigation machine is generally 50-150 kPa, which is much lower than sprinkler irrigation. Because micro-irrigation is less than surface irrigation, it means that the energy consumption of improving irrigation is lower. Improve product quality. 4. Irrigation uniformity: Micro-irrigation system can control the flow of each irrigator, so the irrigation uniformity is high, generally up to 0.85 or more. The previous article：What is the technique of winding up PVC lay flat hose? 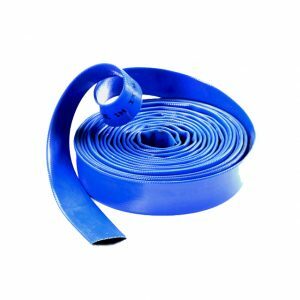 The next article：How do you know the service life of PVC lay flat hose?